Everyone knows how to make a sandwich! You take a couple slices of bread, and put some kind of filling between them. Dead simple, right? Then how come some sandwiches taste so much better then others? Well, it has to do with both the quality of the ingredients that you use as well as the right proportions! 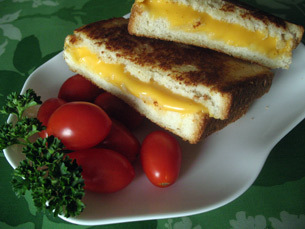 An all time favorite is the good old grilled cheese sandwich. It’s a perfect balance of toasty grilled bread with just the right amount of cheese. 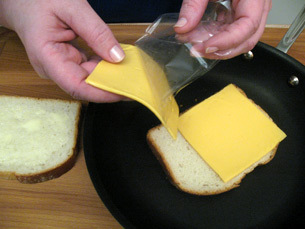 White bread and American cheese, the kind wrapped in plastic, is the best. You can use squishy white bread, the kind you used to feed to the ducks, but a firmer, hearty white bread actually holds its shape better after grilling. 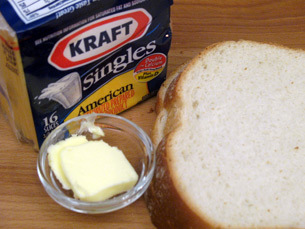 You will also need 1 Tablespoon of soft butter for this sandwich. To soften butter either just let it sit on the counter about 10 minutes or VERY CAREFULLY zap it in the microwave in 5 seconds increments. Softening butter in the microwave is tricky. It goes from a solid to a liquid in the blink of an eye so watch it carefully. 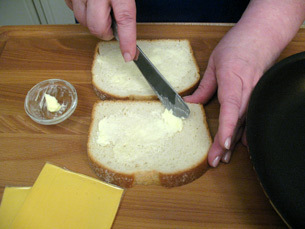 Spread 1.5 teaspoons of softened butter on one side of each slice of bread. 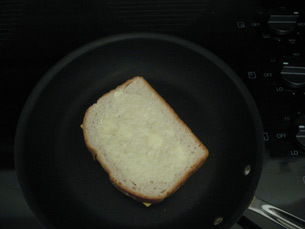 Lay one slice of bread, butter side down, in a non-stick frying pan. Put two slices of cheese on the bread. You may be tempted to use a lot more cheese but don’t! Too much cheese oozes out as it melts and you end up with all that extra cheese in the bottom of the pan or dripping down your hand as you bite into your sandwich! Now cover it with the other slice of bread with the buttered side up. Turn the stove on medium heat and place the pan on the stove. 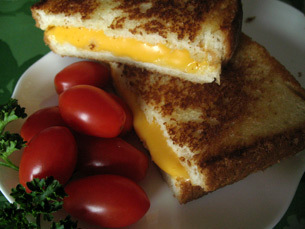 The grilled cheese sandwich needs to cook until it’s golden brown on the outside. This requires peeking occasionally with a spatula. After about 2-3 minutes it should be ready to flip. The second side will take a lot less time to turn golden brown because the pan is already heated up. 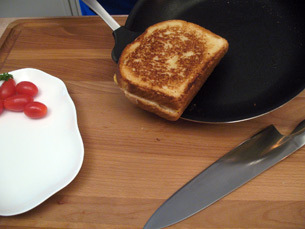 Lift the sandwich out of the pan with a spatula and set it on a cutting board. It’s easier to cut the sandwich in half on a cutting board. Normally you would cut bread with a sawing motion and a bread knife. If you did that to a grilled cheese sandwich it would slide apart. 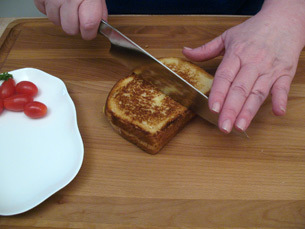 To cut a grilled cheese sandwich use a large kitchen knife and with one swift downward motion slice through the sandwich. 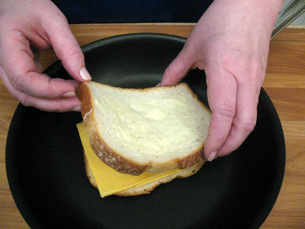 You can add extra bits to your grilled cheese sandwich if you want. Tuna salad, sliced ham, sliced tomato, or even crispy bacon would be great! I just realized that grilled cheese had no comments, and it’s actually my favourite food! So I had to say it here loud and clear. 3 Cheers for grilled cheese!!! My sentiments exactly! Thanks Colin! Great tips, Kathy! Beforehand, I wasn’t sure what proportions would be best and what to serve it with, but now I know, thanks to you! Hi Vanessa! Ahh… proportions are very important! You don’t want all that gooey cheese dripping down your hand! YUM! I have been trying out a bunch of new variations on this classic sandwich. It’s great to experiment with different breads, cheeses and other fillings! 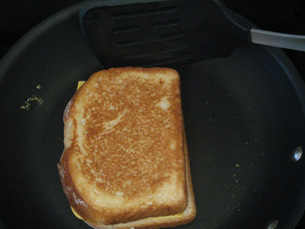 Now I know the secret to making a good grilled cheese.. don’t start with a hot pan. I’ll never burn a grilled cheese again!